Go ahead and grab a tissue. In this heartbreaking scene from The Lion King, Mustafa tries to save his son, Simba, from a stampede and unexpectedly dies early on in the film. Of course, this sets Simba on a journey where he returns to defeat Scar, the lion who orchestrated the stampede that killed his dad. The purpose of this scene is to remind you that life comes at you fast. We are never promised tomorrow, but you can plan for the future today. Of course, planning means developing a course of action that allows your family to pick up the pieces after you are gone and to make this trying time as easy as possible for them. Because you never know what life has for you, the lesson here is to plan ahead and develop an estate plan because that day is coming for all of us. In this scene from Storks, all the babies are delivered and the scene ends with a family welcoming home a newborn. I can remember bringing home our first child and the feeling of walking into the home and coming to a quick realization that my wife and I had a huge responsibility in our hands. I tell my clients routinely that the time to consider updating or changing their estate planning documents is when there has been a change in their life or a change in the law. One of the more, if not the most, profound changes in a person’s life happens when a newborn enters the household. If you do not happen to have an estate plan and you are welcoming a baby into your home, now is the time to get an estate plan. In fact, in Georgia, a Last Will and Testament is a must-have if you have minor children because that’s the only way to name a Guardian for the children. If you don’t have a Last Will and Testament, get one. It’s that simple. If you already have one and you are welcoming a newborn into your life, it’s a good idea to update your Last Will and Testament. Fortunately, we estate planning attorneys are thorough enough to make sure your Last Will and Testament has a “contemplation” clause (meaning your Last Will and Testament isn’t invalidated or confusing just because the newborn isn’t named in the Last Will and Testament, but instead there is language that says you make the Last Will and Testament contemplating future children). In this scene from Despicable Me, Gru, the evil scientist, believes by adopting three girls that he will be able to break into his nemeses’ home when the girls deliver cookies to the home. Spoiler alert: He learns to love the girls as his own and welcomes the chaos they bring into his life. If you have adopted a child, then you are both very blessed. Like the first scene, this scene involves expanding your family. Whenever someone new enters the household, it’s time to review your estate planning documents to make sure they still align with your wishes. Fortunately, in Georgia, adopted children have the same inheritance rights as natural-born children so if you don’t happen to have an estate plan (shame on you first of all), your adopted children and natural-born children will share equally. Keep in mind that this isn’t true for step-children. So, the lesson learned here is, if you are updating your family with an adopted child, to get a Last Will and Testament if you don’t have one and to update your Last Will and Testament if you do have one. In this scene from Step Brothers, the two brothers meet for the first time and are somewhat concerned about how having a sibling in their life will turn their world upside down. Obviously, the comedic turn to this very common life event are these brothers are middle-aged, but act as if they are in their pre-teens. Perhaps bringing a sibling into your family can be a life-altering event no matter what the age. But, there is a good estate planning lesson here. In Georgia, step-children do not have the same inheritance rights as natural-born children or adopted children. Therefore, if you want to give your step-children an inheritance, you need to get/update a Last Will and Testament or your Revocable Living Trust. This is a difficult time in a family’s life. Often times, not only has a spouse departed this life, but the person is likely a beloved parent or sibling or grandparent. There are certain things you should do upon the passing of a spouse and I’ve written about them here. From an estate planning standpoint, it may be necessary to probate the person’s Last Will and Testament. One of the most common mistakes married people make when it comes to estate planning is assuming that your estate will simply pass to your spouse if something were to happen to you. While it is possible to have property pass to your spouse through joint ownership, don’t assume this is true. Recently, I prepared a Last Will and Testament for an older couple. I asked them about their home and they told me they were unconcerned with their real property because they held it in joint tenancy with rights of survivorship meaning the property should pass to the survivor of the two. I asked them to please check just to make sure. The husband called me two days later and indicated he had checked the deed and the home was held in simple joint tenancy. What this meant was the property would have been frozen until they had probated the deceased spouse’s Last Will and Testament which would have added months in time and perhaps hundreds of dollars to unfreezing the property. The lesson here is don’t leave your estate planning to chance. This scene is from my favorite TV show, Lost. In it, Hugo, comes into a sudden increase in Wealth when he wins the lottery. Interestingly, if you know anything about the TV show, he is stranded on an island and this scene is a flashback to a moment that changes his life forever. Of course, none of his fellow stranded islanders are aware of his immense wealth. Although there is no indication in the show, Hugo should have consulted an estate planning attorney following his winning of the lottery. Whenever you have a sudden increase or decrease in wealth, it is always a good idea to reconsider your estate planning objectives. If you happen to have a lot of wealth, you may be concerned with estate taxes. In Georgia, relatively few of my clients need to worry about the estate tax. This is because Georgia does not impose an estate tax. Further, there is an exemption to the federal tax that is so high that most of my clients fall under the exemption and do not have to pay the federal estate tax. However, I do get several clients a year that do need estate tax planning. The lesson here is that estate planning is not “set-it-and-forget-it.” You need to review and update your estate planning documents from time to time, especially if you see a sudden increase in wealth. In this scene from Buried, the character attempts to record on his cell phone his Last Will and Testament. Ideally, you would want to prepare a Last Will and Testament well in advance of actually needing it. It’s one of those things that it’s better to have it and not need it than to need it and not have it. An Oral Will is formally known as a Nuncupative Will. In Georgia, Wills must be written in order to be valid. (The most common type of Last Will and Testament in Georgia is typed rather than handwritten.). So, a Last Will and Testament by video is not valid in Georgia. The lesson here is that you should plan ahead so that you aren’t forced to make a video or “death bed” Last Will and Testament which isn’t valid in Georgia anyway. Working with an experienced estate planning attorney is ideal so that you can have peace of mind that your affairs are in order. As you may be aware, one of the most central estate planning documents is called a Last Will and Testament. In it, you will state your directives as to the disposition of your property following your passing. Everyone who owns anything, no matter how little value it may seem to have, should have a Last Will and Testament. This is because a Last Will and Testament puts you in charge of directing others on your wishes and distribution of assets upon your death. 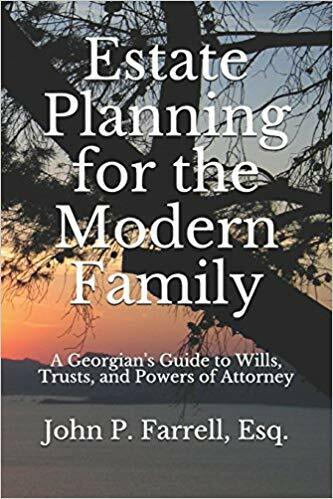 Without a Last Will and Testament or other estate plan, you have no control and the State of Georgia’s rules determines who gets what after your death. These days, many people are opting for the Revocable Living Trust as the primary estate planning vehicle over the Last Will and Testament. In fact, some of my colleagues would say that if you own real estate in Georgia, you should have a Revocable Living Trust so that the real estate can avoid the probate process. I will say that if you own property in two or more states, the Revocable Living Trust is a no-brainer at that point. Often touted as an alternative to a Last Will and Testament, a trust is a legal structure that permits management of your assets by a trustee on behalf of your beneficiaries. A trust can bypass the probate process completely because your assets are transferred to the trust while you are still alive. Therefore, when you die, there’s nothing that needs to be transferred by the probate court (everything is already in your trust). Here are just three of the ways a Revocable Living Trust is better than a Last Will and Testament. First, there are a certain amount of expenses that can be avoided with a Revocable Living Trust. Second, one of the most overlooked benefits to a Revocable Living Trust is that it is a private document. A Last Will and Testament gets filed at the courthouse and becomes a part of the public record where as Trust documents are rarely shared with anyone. Third, with a Revocable Living Trust, your family members will receive their gifts almost immediately. With a Last Will and Testament, the probate process takes time. Again, these are just some of the advantages of a Revocable Living Trust over a Last Will and Testament. A Financial Power of Attorney allows another person or persons to make financial decisions for you in the event you ever become unable to do so yourself. This person is called your agent and they can pay your bills and make financial decisions for you if you can’t do them yourself. If you can’t make these decisions on your own because you are incapacitated and you don’t have a Financial Power of Attorney in place, your family will essentially have to sue you to have you be declared incompetent. Once the judge declares you incompetent, a Guardian will be appointed for you who will have the authority to make those decisions for you. The Financial Power of Attorney (along with the Advance Directive for Health Care below) is just as important as your Last Will and Testament or Revocable Living Trust. You can access a form Financial Power of Attorney from our Legal Resources page of our website here. Like the Financial Power of Attorney above, the Advance Directive for Health Care allows another person or persons to make health care decisions for you in case you become incapacitated. This person would be able to access your medical records and talk to your doctor on your behalf in the event you can’t do so yourself. It also includes what some of us remember as the “Living Will.” You can access a form Advance Directive for Health Care from our the Legal Resources page of our website here. Estate planning doesn’t have to be complicated. Like many things, it’s important to simply get started. As you can see from the movie scenes above, there are plenty of times in your life where it’s important to consider estate planning principles. Now, when you watch your favorite movie, perhaps you will see similar times when you should consider your own estate plan. Don’t delay; we’re here to help ! !